All smiles after the run, enjoying the 805, and a sunny race day. Logan Laszcyk is a Cal Poly SLO and SLO Marathon alum. Many Cal Poly San Luis Obispo graduation bucket lists include activities like completing the 10 mini-burger challenge at Frank’s, the “Tri-Tip” hiking adventure, competing in tossing tater tots to friends at Mother’s Tavern, or camping at Montana de Oro. 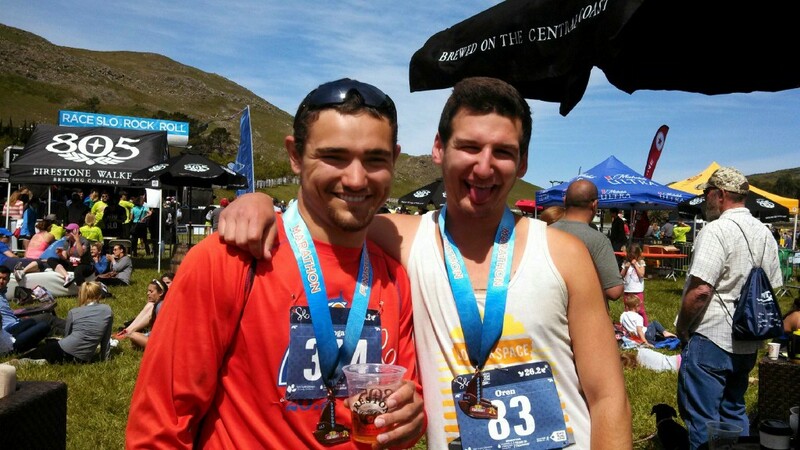 My Boston born roommate had schemed something much more intimidating… Running the SLO Marathon. 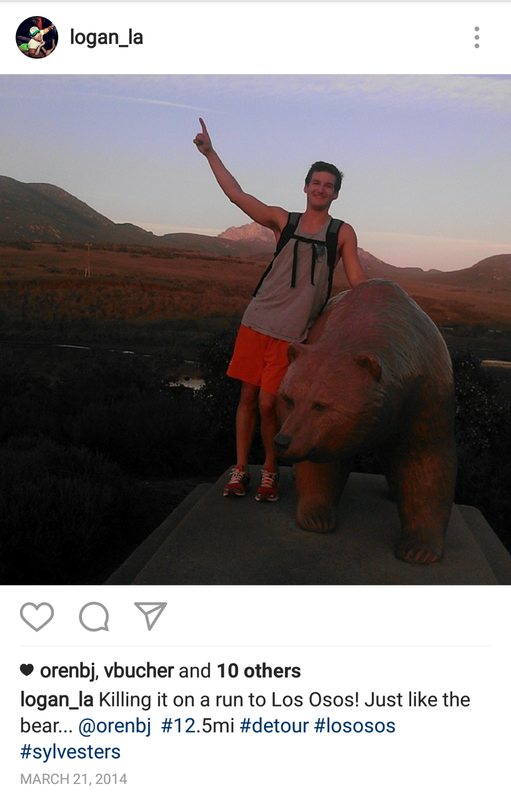 In the winter of 2013, I was challenged to complete the SLO Marathon, a running event and distance that challenges most “bucket list” graduation goals. Neither my roommate, or I, had ever consecutively run a distance that far to date, and were not training for anything in particular at the time. Essentially we were going from throwing parties, being in a band, and “studying” at The Library, to dedicating hours per week to running. As someone who played intramural sports, this is what I was used to associating running with. If I went on a jog it was usually with the intent of “ball sports” fitness (softball, flag football, etc.). Once we committed to this challenge via race registration, the next step for me was putting a plan together. A quick Google search later, I landed on the 16 week Marathon Rookie training schedule. I printed it out, taped it to my wall, and began following it as close as I could. Without boring you with all my training stories, I’ll share my favorite moment during this period. It was a Saturday afternoon around 11 am in early March 2014, a little over a month before the race. Starting relatively close to campus, I had made my way past Bishop’s peak on LOVR, on my way to unknowingly running the farthest distance to date at about 24 miles. The long, windy LOVR stretch had brought me to a country side street called Turri Road. This time of year the mountainous surroundings in the area are a gorgeous green, so I made the impulsive decision to run northeast toward another one of the Nine Sister peaks. Dragged my roommate along with me for a follow up training run on the same route. As I began to solely make my way up the steepest climb of the run, I distracted myself by looking at the cattle and a distant tattered barn. Then in the corner of my eye something in the air caught my attention… I looked up and saw an act of nature that I could only compare to a scene from Planet Earth. Flying around was a Red-Shouldered Hawk. After a quick double-take, I realized in the grips of its talons was a squirming rattle snake! Watching in wonder, I began to feel excitement, and a powerful rush of emotion at about mile 10. A few seconds later a second hawk entered the scene in the attempt to steal the snake from the other! The action was so quick I wish I could have stopped and stayed to watch, but I was committed to finishing this lengthy run. As I approached the crest of the hill I was pleased to see a lonely photographer sprawled in the grass capturing the scene I had just witnessed. The euphoric, passionate rush of emotion I felt almost 3 years ago is a memory that has honestly yet to stray far from my thoughts. Not sure why I felt this way, but the well-known title of “runner’s high” is a term best used to describe this sensation. The combination of running in solitude, experiencing a sunny central coast spring day, and witnessing a bird’s dance with danger all together created a powerful image that for some reason I feel I will never forget. 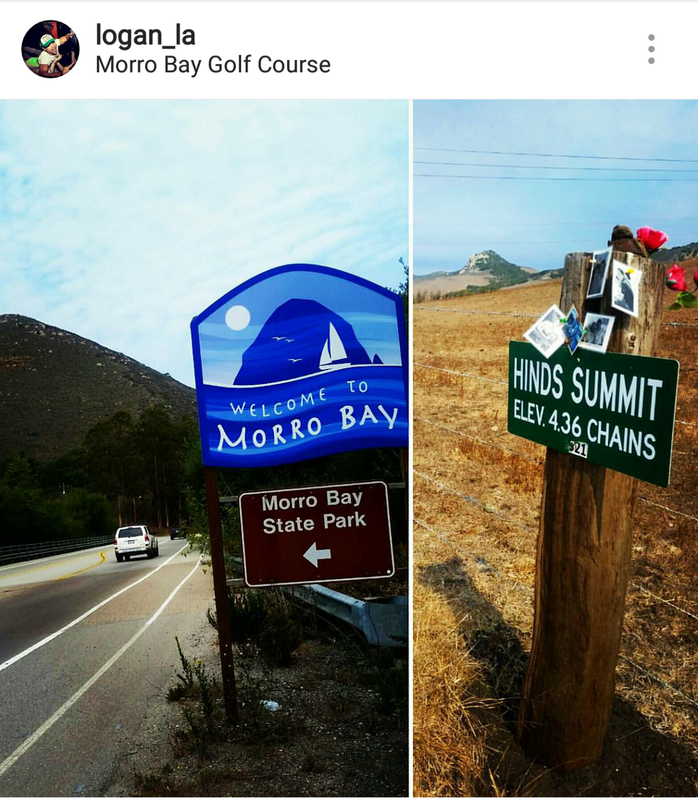 Follow up run from Morro Bay to Turri Road to San Luis Obispo after the marathon. A month later I finished the SLO Marathon with a 3 h 49 min time. Shot right after the finish at Madonna Inn. 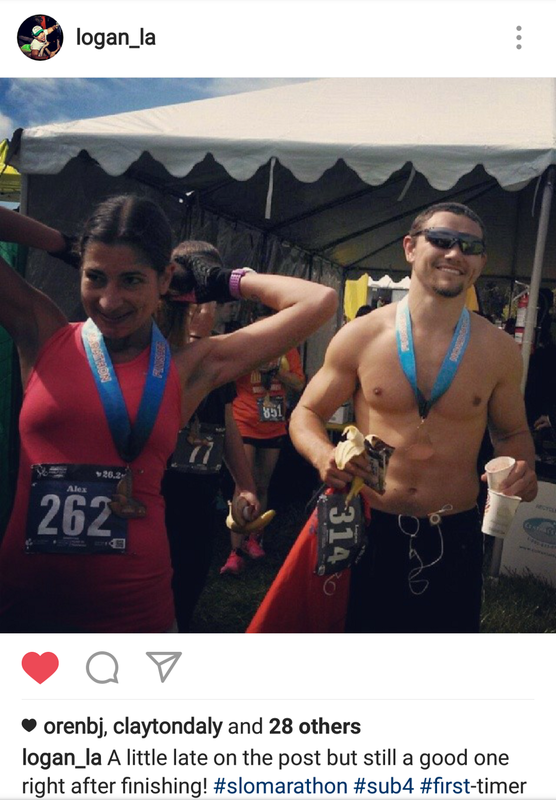 Since then I have run 3 marathons, and dozens of half-marathons spanning across California, with one in Singapore and one in Japan. Living in North County San Diego, running with groups now. Thanks for reading and keep on running! Established in 2008 to bring world class sporting events to the beautiful California Central Coast, the Race SLO family of annual events currently includes the SLO Marathon + Half and Family Fitness 5K (Spring), Healthy Running Conference (Spring), SLO GranFondo (Fall) and SLO Ultra at Wild Cherry Canyon (Fall).